Polenta is a cornmeal dish of Italian origin, but present in gastronomies around the world. The different variations that exist have made the dish an ethnic food of many cultures, despite it starting out as peasants food. Polenta is rich in carbohydrates and provides small amounts of protein with a good amino acid profile. The dish is a source of B vitamins, notably thiamine, pantothenic acid and folic acid, as well as phosphorus, magnesium, potassium, manganese and zinc and has a moderately low calorie content and no gluten. What is polenta? Polenta is a traditional ethnic food made primarily from boiled cornmeal (maize flour or corn flour). Polenta is a mush, porridge or cereal pudding. Although the name now refers to a dish made exclusively from cornmeal, in the past polenta was made with whatever ground starchy grains were available, including spelt, millet and buckwheat. The dish is prepared by boiling, but can be baked, fried or grilled afterwards for more variety or as part of more complex dishes. How is polenta made? There are multiple polenta recipe variations. The traditional method involves boiling cornmeal in water in a large pot. Typically, 5 times more water than cornmeal may be used to make traditional polenta which is a firm dish. Coarse cornmeal was often used to make the dish, but nowadays a finer ground cornmeal is available for a softer, creamier texture. The most interesting aspect about making polenta is the fact that it requires a minimum of 30 to 45 minutes of boiling and constant stirring in order for the starch in the cornmeal to become gelatinous and give the polenta its characteristic consistency. Making large amounts would take up to 4 hours. Polenta variations. Regular cornmeal takes longer to cook, but pre-cooked cornmeal is also available and can reduce cooking time to around 15-20 minutes. Because polenta bubbles intensively and can splatter over short distances, be careful when stirring it. The original polenta recipe requires a coarse cornmeal and is made to have a thick, extremely firm consistency. It was often poured directly from the pot onto a wooden table or large cutter (see the image above). Softer polenta can be made by adding less cornmeal to the water and using a finer cornmeal can give it a creamier consistency. The dish is present in cultures throughout Europe, Northern Africa and the Americas. Some cultures prepare a firm polenta to eat instead of bread or other cereals with a main dish. Polenta makes an excellent side dish for stews, especially heartier ones made with beef or pork, tomato sauces and vegetables. Italian cuisine pairs it with various cheeses and mushrooms, even fish. The traditional Romanian polenta, called ‘mamaliga’, would be made in a deep cast iron pot and eaten with raw onions and cow, sheep or goat cheese. For the poor families, it would substitute bread, which is why Romanian polenta would be firm, lending itself to be cut into slices like bread. It was also commonly eaten in cow’s milk. A favorite recipe was hard boiled eggs mixed with butter, chunks of matured cheese, sometimes fried homemade sausages covered with hot polenta. A loose polenta can be mixed with sugar and eaten as a desert. It was also commonly eaten with fried forest mushrooms and crushed garlic mixed with salt and water or sour cream and meat stuffed cabbage rolls. 1) Low in calories. Polenta is basically cornmeal or maize flour diluted with water. And whole grain yellow corn flour has around 420 kcal per cup (117 g). While the calorie content cannot be measured exactly, a serving of traditional polenta (firm and consistent) often has an estimate of 80-100 kcal/100 g, less than half compared to plain white bread (read more about polenta vs bread: which is healthier). 2) Gluten-free. Polenta is actually gluten free because it is made from maize or corn which lack the protein gluten. This protein is what helps wheat products rise during baking. However, many people experience adverse reactions to gluten in food and develop diseases and disorders such as Celiac disease, wheat allergy or gluten sensitivity. An intolerance to gluten often causes symptoms such as bloating, diarrhea or constipation and stomach pain. Fortunately, avoiding gluten products restores normal digestive functions. In addition to cornflour, rice and rice flour also lack gluten. Below is a short video of polenta bubbling during cooking. 3) Source of antioxidants. Cornflour can be made from any variety of corn, including yellow, white or purple-blue corn. Every pigment that gives corn its specific color is actually an antioxidant, either carotenes, anthocyanins or other polyphenols and contributes to reducing oxidative stress and protecting against chronic disease. A purple-blue cornflour polenta, although not traditional, would have the highest antioxidant value. 4) Low protein, fat and fiber content, but good carbohydrates profile. 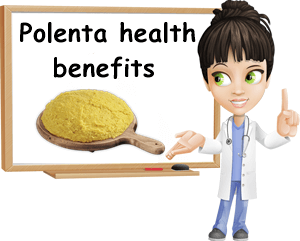 Eating polenta provides negligible amounts of protein, fats and fiber. At the same time, it is a good source of quality carbohydrates for a good energy metabolism. It is important to remember that polenta is made from unrefined cornflour which preserves all the nutritious components of the corn kernel. 5) Poor vitamin and mineral value. The nutritional value of polenta is poor, considering the already nutritionally modest cornmeal is diluted several times with water during cooking. The dish provides small amounts of vitamins B1, B5, B6 and B9, iron, magnesium, phosphorus, potassium, manganese, selenium, copper and zinc. The vitamin B3 in corn, cornmeal and polenta is poorly absorbed.